Bettery life is something that a lot of potential Di2 or EPS (and now SRAM eTap of course) customers consider before taking the plunge. How many miles am I going to get? Will it suddenly go flat mid ride? Is there any warning? 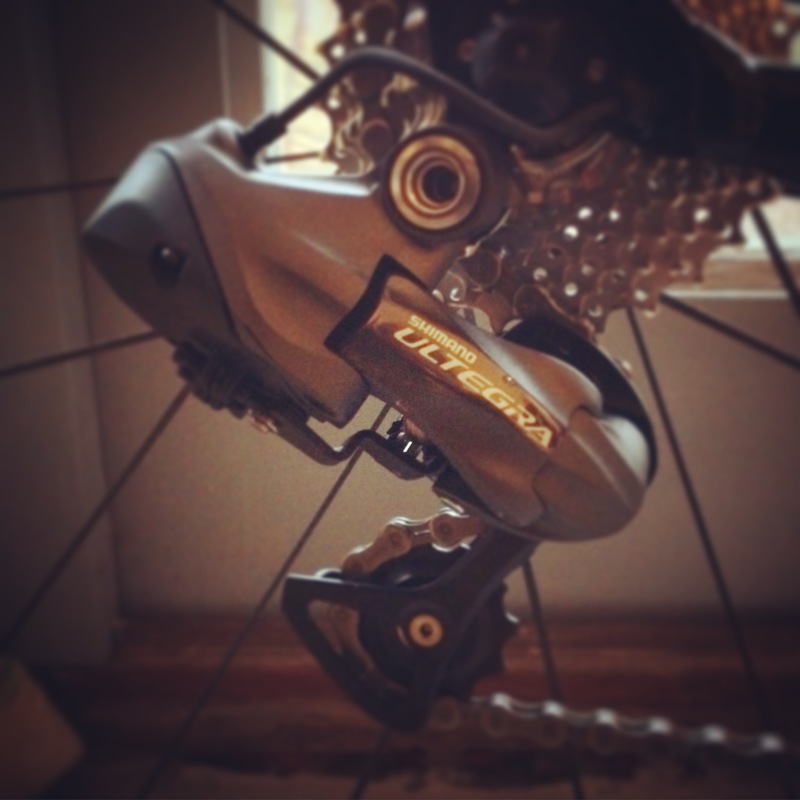 I’ve been riding Shimano’s 10-speed Ultegra Di2 since late last year and have covered quite a few miles on it now. I absolutely LOVE IT! It hasn’t missed a beat, is a real pleasure to use and most of all makes you feel totally pro. Blinking red = Charge me now!! Even on blinking red you still have (apparently, I haven’t tested it out) over 200 shifts left before completely draining the juice. When it gets really, really low, first the front derailleur quits shifting, then after a couple of hundred more shifts the rear derailleur stops in whichever cog you happen to be riding at the time. From then on you’re single-speeding home! From a 100% charged starting point, the indicator light on my system changed from solid green to blinking green at 750 miles (1200km). I do change gear quite often, but not so much on the front which requires more battery power. After 1030 miles (1650km) the indicator light changed to solid red. Not wanting to chance it, I then charged the system up to 100% again! Charging is simple enough. A port on the side of the junction box connects to a USB cable so you can charge from your computer/laptop or any other USB point. I’m guessing the battery would be good for 1300 miles on a single charge, probably more. That said I’d be inclined to charge it as soon as you hit solid red – maybe sooner if you’re planning some really long rides. 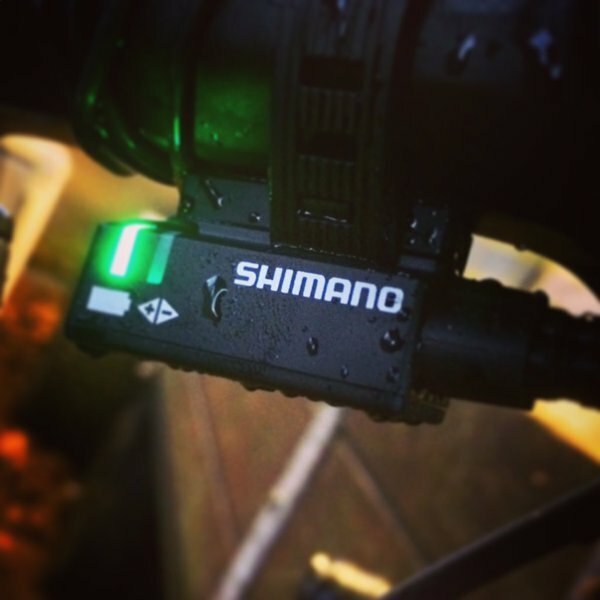 So there you go, as long as you’re sensible and keep an eye on that all-important indicator, there’s no reason for your Shimano Di2 to ever run out of juice while out on a ride! Just keep an eye on that light! Easier said than done … even with those indicators, I still have a bunch of friends who got themselves into the single speed mode. I guess it’s just human nature to procrastinate to that level. Yep know a couple of people who’ve gone into rear-only and single speed mode on a ride. Easy to forget I suppose. I check mine every time I put the bike away after a ride, get into a habit and avoid any issues. 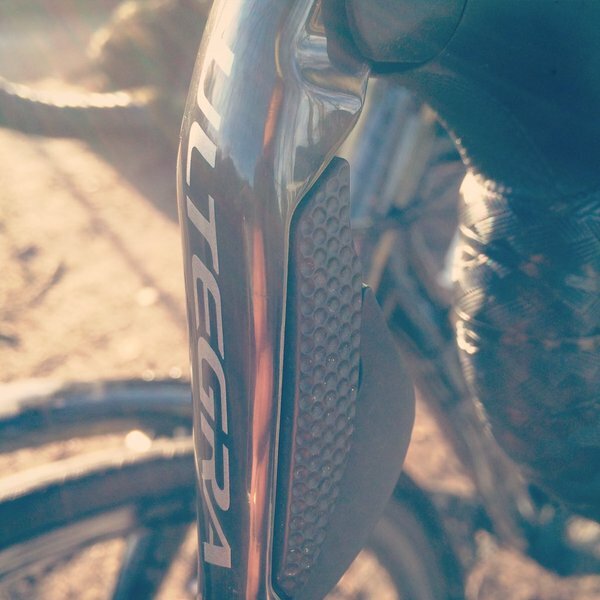 I’m getting Ultegra Di2 on my next bike, enjoyed the review. I have 2 Di2 bikes,. One external on my road bike and another a Cervelo p5 six with internal battery. I never had a problem on the road yet. I usually charge it after a week of riding . But, recently on 2 separate occasions my internal battery was completely dead with out a single ride after 3 months of leaving in on its rack in my house. Battery might be reaching the end of its life cycle, especially if you’re riding enough to charge weekly. Mine still seems fine. I only charge it when the LED changes to red (sometimes flashing red if I’m feeling brave) so it’s probably had less charging cycles. Spot on! It’s just another step in good bike maintenance. Thanks for the comment. Thanks for the review. It confirms what I’ve suspected which is I am not getting normal battery life. Mines lasts about 200 miles, but it does charge in about an hour. I could be fine if I just throw it on the charger every weekend. So far I’ve gone into no front or single speed mode 4 times this year. i have the original di2 and bought it off eBay, pssobly someone dumped a battery with an issue on me, someone wrote on the battery, probably has been in for service. Probably worth sourcing a new battery as that is not normal, I’d say it’s getting past it’s best by a long shot! Replace it before it totally bunks out on you. Is yours the original external battery Di2 version? That shud never happen. You got a bad battery. I have 3 bikes with di2, built up in 2013, using batteries with a 2011 date stamp on them. Two of the three batteries are still good in May 2017, seeing avg 5,000 km annually – so that’s five year battery life. They are probably charged once per 1,000 km. Battery life really depends on the number of shifts, and that will depend on terrain and individual riding style. My battery is still going strong. Hardly ever needs charging (it’s the Zwift Bike now so getting plenty of shifting). I recharged my battery after it hit red. I then did not ride for a month due to weather. Upon checking the battery it was completely dead, no lights. I put it back on the charger and it shows it’s charging. I got a flashing red right after I starting charging so I know it’s alive, but now wonder if this battery is going to be unreliable. When is it time to replace the battery? Did you charge it up fully? That doesn’t sound normal, but it could have been a one-off with the battery discharging over time. I’ve left mine for a month before with no noticeable discharging. If it charges up and works again it’s probably fine, but worth keeping an eye on it. Mine is still going strong and showing no signs of degradation. Must remember to charge it tonight though, it’s flashing red!